18th century France. The terrible “Beast of Gevaudan”, a suspected werewolf, is ravaging the countryside killing victims. King Louis has offered 300 livre for its destruction. An outcast woodsman goes on the hunt and and almost brings him down before being mauled in the arm and escaping. He stumbles into the cabin of a mysterious woman, who may or may not be a witch, and together they form an uneasy alliance to claim the bounty. With this premise, the Halloween season, and the theme of Know’s season–“Fear Itself”–you might assume that their latest offering, The Man-Beast, might resemble a classic Hollywood horror film. You would be wrong. Instead, The Man-Beast takes its inspiration from the very best of Hollywood’s film noir, like “Double Indemnity” or “The Postman Always Rings Twice”. It is a tale of passion and betrayal, a story of two people desperately trying to cling to love and avoid the inevitable consequences of greed and an immoral act. Oh, and then a little bit of well-placed horror sprinkled in. The playwright, Joseph Zettelmaier, was responsible for two other recent Know favorites, “All Childish Things” and “Pulp”; although those plays could hardly be more different in setting and style than this one, they all share some of the features that make his plays a delight to watch: witty dialogue, incisive character development, and several twists that leave the audience guessing. My only quibble with the script was a certain inconsistency in style, at times more classic and old-world, at times more vernacular and modern, with a smattering of Frenchisms thrown in that seemed more deliberate than natural. Still, that hardly detracted from the enjoyment. 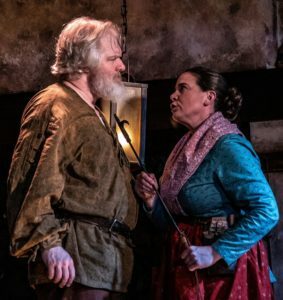 This two-person play was exquisitely cast with two Cincinnati-area notables–Jim Hopkins from the Shakespeare Company and Jennifer Joplin, well known to ETC and Human Race patrons. Hopkins, with his imposing frame and powerful baritone, embodies the feral hunter, Jean, perfectly. Joplin, as Virginie, brings wonderful humor and humanity to her role, while maintaining an aura of menace which grows as the play proceeds. Together, they have remarkable chemistry which lends authenticity to their complicated but compelling relationship. The play is presented at the lower level near the bar, whose intimate setting, for the most part, served the play well. I did get distracted by the lanterns hung from the low ceiling which Hopkins had to frequently dodge (sometimes unsuccessfully). The night I was there, three tall gentlemen sat in the first row and the lack of graded levels of seating gave my wife and I a somewhat obstructed view. But otherwise the single set, designed by Andrew Hungerford–Virginie’s cabin–fit well in the space and was extremely well-appointed. Special kudos to the Prop Designer, Rebecca Armstrong. But the real star of this production was the taxidermy designer, Mara Tunnicliff. A large bear head dominates the set throughout the play, but pales in comparison with the realistic taxidermic creation presented in the second half, a stunning prop which I can’t imagine how it was created or found. Director Brant Russell wisely refrained from too many sound or lighting effects but let the suspense and horror arise from the characters and the story themselves. Those sound effects (Doug Borntrager) and lighting effects (Andrew Hungerford) that were used were well-placed and effective. This was written by Sheldon Polonsky. Posted on Saturday, October 20, 2018, at 6:07 pm. 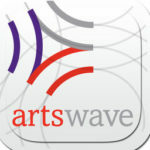 Filed under Stage Insights News, Stage Insights Reviews. Bookmark the permalink. Follow comments here with the RSS feed. Comments are closed, but you can leave a trackback. ‹ Cincinnati Shakespeare’s “1984” Will Leave You Wide-eyed!